JGCRI has been a world leader in integrated assessment (IA) modeling since the inception of the field more than three decades ago. It houses one of the world’s premier integrated assessment models – the Global Change Assessment Model (GCAM). JGCRI researchers also participate in the development and use of a range of related human and Earth system models. And JGCRI is a leader in collaborative research linking models of varying regional, temporal, and spatial scales to simulate the complex interactions among energy-water-land-socioeconomic-climate systems and to gain greater insight on key factors contributing to functioning of these systems and changes in them. 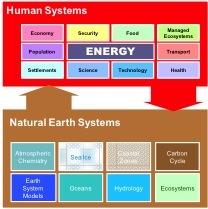 JGCRI research on integrated human-Earth system modeling aims to build on this foundation to help lead the global community in developing the next generation of human-Earth system models that realistically represent the complexity of these systems and yield reliable scientific information to increase understanding and inform decision-making. Integrated assessment (IA) modeling tools have played a critical role over the last two decades in improving understanding of how human actions in energy, land, and economic systems interact with one another and affect and/or affected by the global environment. As modeling tools, computation capabilities, and the science of human-Earth system research have advanced, the questions that science researchers and decision makers are asking have also evolved in scope and complexity. Therefore, integrated assessment modeling is now poised to explore a range of scientific questions that go well beyond those of the previous decades. Scientists and decision-makers are in need of scientific information about both human impacts on the environment and the influence of the environment on energy, water, land, and economic systems. The next generation of IA modeling tools must attempt to close the loop – understanding these two-way interactions between human and Earth system. In addition, as the influence of IA modeling activities increases, there is also increasing improve the skill of IA modeling tools, improve substantially our ability to characterize uncertainty, and provide results on a time frame, spatial scale and in formats that are useful to scientists and decision makers. Global Change Assessment Model – The Global Change Assessment Model (GCAM) is a partial equilibrium model of the world with 32 regions. GCAM operates in 5 year time steps from 1990 to 2100 and is designed to examine long-term changes in the coupled energy, agriculture/land-use, and climate system. GCAM includes a 283-region agriculture land-use module and a reduced form carbon cycle and climate module in addition to its incorporation of demographics, resources, energy production and consumption. The model has been used extensively in a number of assessment and modeling activities such as the Energy Modeling Forum (EMF) , the U.S. Climate Change Technology Program, and the U.S. Climate Change Science Program and IPCC assessment reports. GCAM is now freely available as a community model. See GCAM Community. For more information, contact Pralit Patel (pralit.patel@pnnl.gov) or Leon Clarke (leon.clarke@pnnl.gov). Hector – An open source, object-oriented, simple global climate carbon-cycle model. It runs essentially instantaneously while still representing the most critical global scale earth system processes, and is one of a class of models heavily used for for emulating complex climate models and uncertainty analyses. For more information on Hector, please contact Corinne Hartin (corinne.hartin@pnnl.gov). EPIC – The Environmental Policy Integrated Climate (EPIC) Model is a process-based agricultural systems model composed of simulation components for weather, hydrology, nutrient cycling, pesticide fate, tillage, crop growth, soil erosion, crop and soil management and economics. Staff at PNNL have been involved in the development of this model by integrating new sub-models for soil carbon dynamics and nitrogen cycling. For more information, contact Xuesong Zhang (xuesong.zhang@pnnl.gov). SWAT – The Soil and Water Assessment Tool (SWAT) is a public domain model jointly developed by USDA Agricultural Research Service (USDA-ARS) and Texas A&M AgriLife Research, part of The Texas A&M University System. SWAT is a small watershed to river basin-scale model to simulate the quality and quantity of surface and ground water and predict the environmental impact of land use, water management practices, and climate change. SWAT is widely used in assessing sustainability of bioenergy cropping systems, soil erosion prevention and control, non-point source pollution control and regional management in watersheds. Staff at PNNL have been involved in the development of this model by linking carbon cycling along terrestrial-aquatic continuum. For more information, contact Xuesong Zhang (xuesong.zhang@pnnl.gov).